Philadelphia-based artist Alexandra Tyng painted the portrait of Gerri and Bennett Hall. At the evening party celebrating the opening of Gerri C. LeBow Hall, a special guest was seated among the dignitaries during the formal portion of the program. Alexandra Tyng sat relaxed, as she had no formal role in the celebration. She was there for one reason alone: to witness the unveiling of her latest masterpiece, the portrait of Gerri and Bennett LeBow that the University commissioned her to paint to hang in the new building. 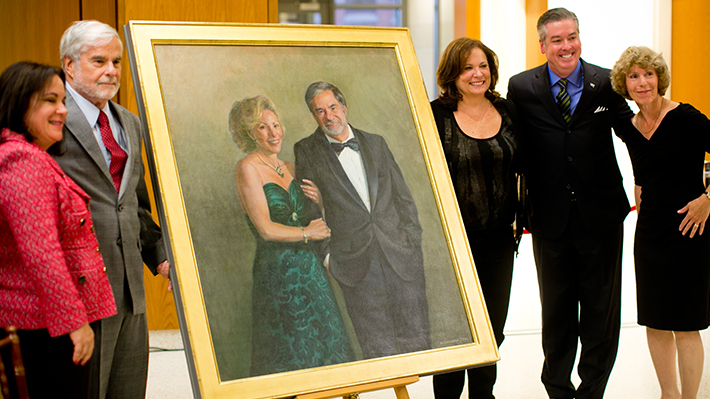 Following Drexel President John Fry’s opening remarks, the College benefactor and his two daughters did the honors of revealing the stunning portrait of LeBow and his late wife, Gerri. Tyng’s painting is an oil on linen portrait of the affectionate couple dressed for a formal occasion – Gerri, in a floor-length emerald gown; Ben, in a handsome tuxedo. The painting was later hung by the building’s east entrance. Unfortunately, because of Gerri’s passing, the artist and she never had the opportunity to meet her before Tyng started the commissioned work, but she was able to gather references to paint a realistic piece. Born in Rome, Tyng has lived the majority of her life in Philadelphia where she has her studio and founded Portraits for the Arts, an ongoing philanthropic project to enhance the arts in Philadelphia. The project generates funds with the sale of paintings of visual artists, musicians, writers, architects, visionaries and benefactors of the artistic community. To date, she has had 10 solo exhibits, and her work can be seen throughout the country in public, corporate and university collections. She has also received numerous national awards for both her portrait and figure paintings and her landscapes, and has been featured in major art publications. This isn’t Tyng’s first commission for Drexel. Her first project came in 1997, when she painted former President Taki Papadakis. Since then she has painted a portrait of University Trustee R. John Chapel, which hangs in the fourth floor of Pearlstein, and is working on others.